Our trays are made from cardboard and our punnets are made from plants, not oil (PLA). Each punnet is commercially or home compostable. Cornstarch (a completely renewable resource) is used in the manufacture of our punnets and will break down completely under the right conditions. These punnets have a carbon footprint up to 80% lower than traditional plastic punnets. Or you can compost these at home in your own compost heap, just remove the soakage pad inside first, and cut up your punnet into strips. Place in your compost bin and these punnets will start to degrade within weeks. For a product to be deemed compostable it needs to biodegrade (break down naturally) with a byproduct which is completely non-toxic and all of this needs to happen within 90 days. That’s why they are generally considered to be “commercially compostable” as it can be guaranteed to break down in a commercial facility within the specified time frame. Whilst the punnets could biodegrade within 90 days in a home compost environment, due to the conditions at home are not controlled or standardised it isn’t guaranteed within the 90 day timeframe. 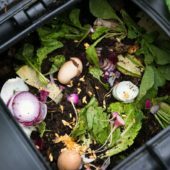 If it took 91 days to break down in a home environment, it would have still turned to compost but it couldn’t technically be called “compostable” because all international standards require this to happen within 90 days. Our trays are made from virgin kraft paperboard which is used for the highest level of product integrity and is extremely sturdy. This material is FSC paper sourced from sustainably managed plantations.